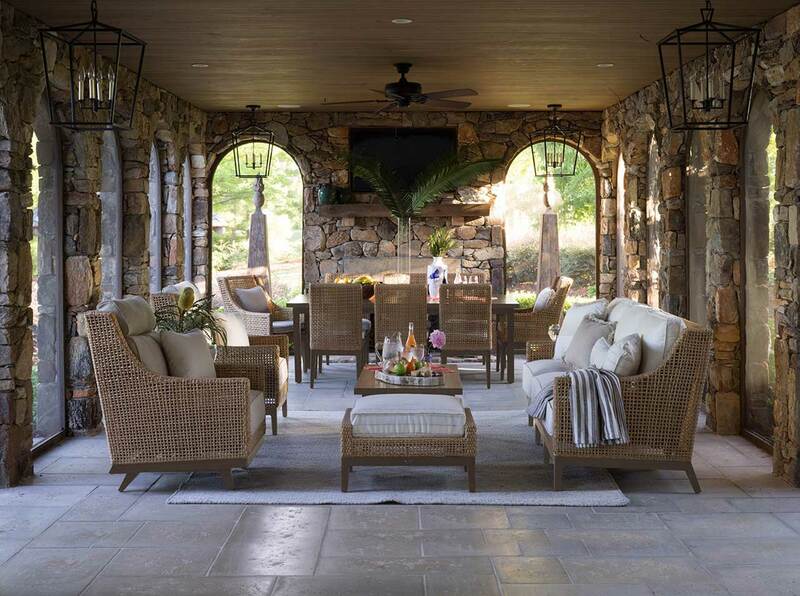 Instead of the usual webbed lounge chairs and plastic patio furniture, create comfortable seating arrangements with wicker, rattan and bamboo furniture. Cover upholstery with canvas, denim and other outdoor-friendly fabrics. An attractive sisal indoor-outdoor rug will help to anchor your outdoor space while creating comfort underfoot. Not sure which color direction to take? A neutral pallet of white tones is a summertime classic. Don’t stick to just one shade of white– mix things up with upholstered pieces in shades of sand dollar, oyster and pearl. Paint your old chairs with white enamel. Add interest with texture: nubby twill here, sleek canvas there. A neutral scheme gives you plenty of chances to play with bold colors. Pile a lounge with plump pillows in tones of cardinal red and robin’s egg blue to add personality and pizazz. Hang a sweet selection of wind chimes made of bamboo, ceramic, metal and glass to provide a hint of melody every time a breeze blows by. Tack a strand of Himalayan prayer flags along patio eaves for a free-spirited, exotic touch. Hang small glass prisms from patio rafters and tree limbs to enjoy dancing rainbows on sunny days. Is your porch covered? Hang an unexpected chandelier above a picnic table. If your porch offers access to electrical outlets, illuminate your outdoor space with a reading lamp or even a 60s-style lava lamp. Appropriately-placed wireless speakers let you enjoy your favorite music while lounging poolside. Love to eat outdoors? Spread a lovely table with elegant linen and don’t hesitate to use the good china. Nobody expects that, but everyone appreciates it. A few potted plants here and there can make the outdoors even more outdoorsy. Be creative when choosing containers: plant a palm in a halved wine barrel and grow sweet peas in colorful coffee cans. If your patio space is too shady to grow flowers, poke a few silk geraniums into foliage plants for an instant burst of color. When you create a great outdoor space, it’s almost like adding a new room to your home. Invest a few weekends putting together your ideal patio space now, and enjoy the fruits of your creativity all summer long.